A female saola, captured in 1996. One of the most secretive creatures on Earth — the saola — has been photographed in Vietnam for the first time in 15 years. 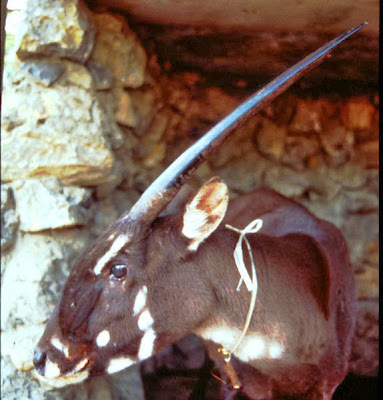 Scientists first discovered the saola in 1992 in Vietnam near the country's border with Laos. It was the first large mammal new to science in more than 50 years. But since its discovery, the elusive creature has rarely been seen in the wild, earning it the nickname the "Asian unicorn" (even though it has two long horns instead of one). A lone saola was documented this past September by a camera trap set up in the Central Annamite Mountains by the World Wildlife Fund (WWF) and Vietnamese wildlife officials. "When our team first looked at the photos we couldn't believe our eyes," Van Ngoc Thinh, head of the WWF in Vietnam, said in a statement. "Saola are the holy grail for Southeast Asian conservationists so there was a lot of excitement. This is a breath-taking discovery and renews hope for the recovery of the species." Though the beast is more closely related to wild cattle, it resembles an antelope with two sharp horns that can reach up to 4 feet (1.2 meters) in length. Scientists suspect that no more than a few hundred or a few dozen saola exist in the wild, but they have not been able to come up with a precise population estimate. The species is listed as critically endangered by the International Union for Conservation of Nature. 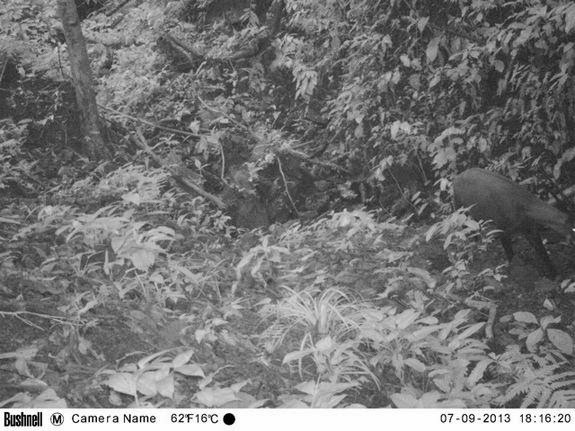 A camera trap photo taken on Sept. 7, 2013, shows a single saola moving along a rocky forest valley. Now if we can discover one of these large animals in the 1990's, do you think it's possible that we can discover Bigfoot in the near future?